If you like being active and learning, this is the vacation for you. The three capitals, Phnom Penh, Vientiane, and Hanoi await you with world class golf and immersion into the histories and cultures of Cambodia, Laos, and Vietnam. It starts in Phnom Penh with our staff waiting to greet you upon arrival. After a quick check-in to the hotel of your choice, you’ll tour the National Museum of Cambodia learning the culture and history of this kingdom. The next two days in Cambodia’s capital are centered around morning golf at two championship golf courses with afternoon visits to two of the most popular cultural attractions the city has to offer. Then you are off to Siem Reap, a very short flight away, where you will see the magnificent and storied Khmer ruins at the UNESCO World Heritage site at Angkor Wat. You will enjoy a day of golf and a day of sightseeing in this historic town. Next stop, Vientiane in Laos where you’ll enjoy golf at Dansavanh Golf & Country Club in a picturesque lakeside setting among tropical forests at over 1000 feet elevation. After your round, try your luck in the modern casino before the comfortable drive back into the capital. The next morning it is golf at the SEA Games Golf Club, which was built specifically for Vientiane to host the 25th SE Asian Games. The afternoon attraction is the Lao National Museum. Late the next morning it is off to Vietnam. 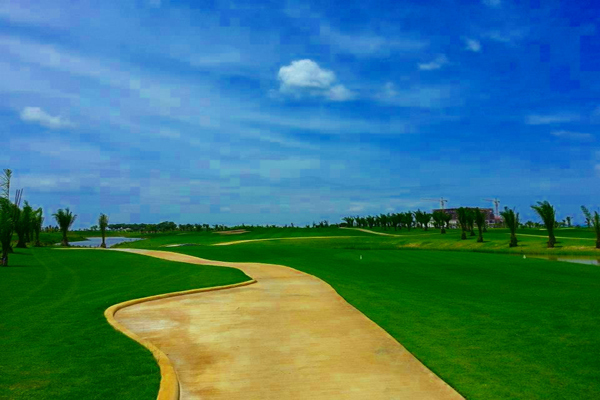 On day nine in Hanoi, you will play golf at the challenging and scenic Kings Island Golf Resort just outside the capital city. This mature course features 36 holes with outstanding mountain and lakeside views. After golf, enjoy your choice of the many museums and cultural attractions in Vietnam’s capital city. In the morning, it is a short drive up to cooler elevations and the Tam Dao Golf Resort for a truly memorable way to cap off this active and interesting Cambodia golf holiday. Day 1 Arrive Phnom Penh and after being welcomed by our staff you will be transported to your hotel of choice for a quick check-in; then it’s off to the National Museum of Cambodia for an afternoon immersed in the history and culture of the kingdom. Day 2 Morning golf at Grand Phnom Penh Golf Club and the afternoon takes you to see the Royal Palace. Day 3 Morning golf at this capital’s rising star, Garden City Golf Club; after lunch see the Silver Pagoda before a late afternoon quick flght to Siem Reap and hotel check-in. Day 4 Morning golf at Angkor Golf Resort and afternoon tour of Angkor National Museum. Day 5 Full day sightseeing tour at Angkor Wat World Heritage site, including lunch; late afternoon flight to Vientiane and check-in to hotel of your choice. Day 6 Morning golf at Dansavanh Golf & Country Club and optional visit to casino on premises. Day 7 Morning golf at SEA Games Golf Club and after lunch visit the Lao National Museum. Day 8 Late morning short flight to Hanoi, Vietnam, check-in to hotel of your choice; afternoon visit to your choice of the many museums. Day 9 Morning golf at Kings Island Resort; after lunch visit your choice of cultural attractions. Day 10 Morning golf in the cooler elevation of Tam Dao Golf Resort; afternoon free for shopping in Hanoi.